13X Molecular Sieve manufacturers,13X Molecular Sieve exporters,13X Molecular Sieve suppliers,13X Molecular Sieve OEM service. 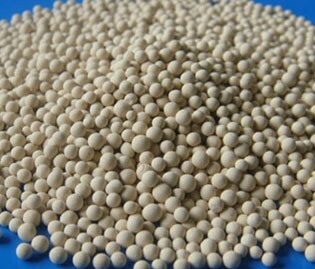 Unitedhb Group (www.unitedhb.com) produce 13X molecular sieve. 13X Molecular sieveis the sodium form of the type X crystal, has a much larger pore opening than the type A crystal. It will absorb molecules with a kinetic diameter of less than 9 Angstrom (0.9 nm) and exclude those larger. It also has the highest theoretical capacity of the common absorbents and very good mass transfer rates. It can remove impurities too large to fit into a type A crystal and is commonly used to separate nitrogen from oxygen. 1,Removing water, carbon dioxide and hydrocarbons from feed gas in air pre- purification units prior to the cryogenic air separation. 2, Removal of water, hydrogen sulfide, mercaptan and high molecular weight sulfur compounds in NGL, LPG, and liquid hydrocarbons (e.g. propane, butane). 3, Deep dehydration of compressed air, instrument air and inert gas. 4, Dehydration and purification of ammonia synthesis gas. 5, Removal of odorous sulfur compounds from aerosol propellants. 6, Removal of carbon dioxide from cracked gas. The product should be regenerated after a certain period of adsorption. The ppropriate regenerated temperature would be better below 350℃. 13X molecular sieve- Zeolites are available in beads of 1-2 mm, (10x18 mesh) 2-3 mm, (8x12 mesh) ,2.5-5 mm, (4x8 mesh) and as powder, and in pellet 1.6”, 3.2”. You can call us or write to sales@unintedhb.com to get more details.